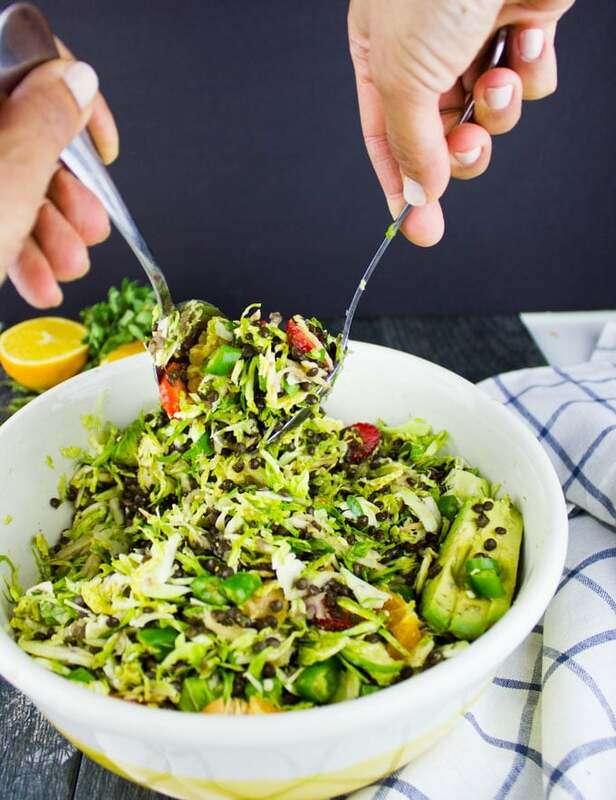 This Citrus Lentil Salad with Shredded Brussel Sprouts, Apples, Strawberries, and a zesty Orange Dressing makes for a healthy, protein-packed salad, that can be served as a side dish or a light main course! Disclaimer: This healthy, tasty recipe is sponsored by my friends at USA Pulses and Pulse Canada. All opinions and thoughts are my own. 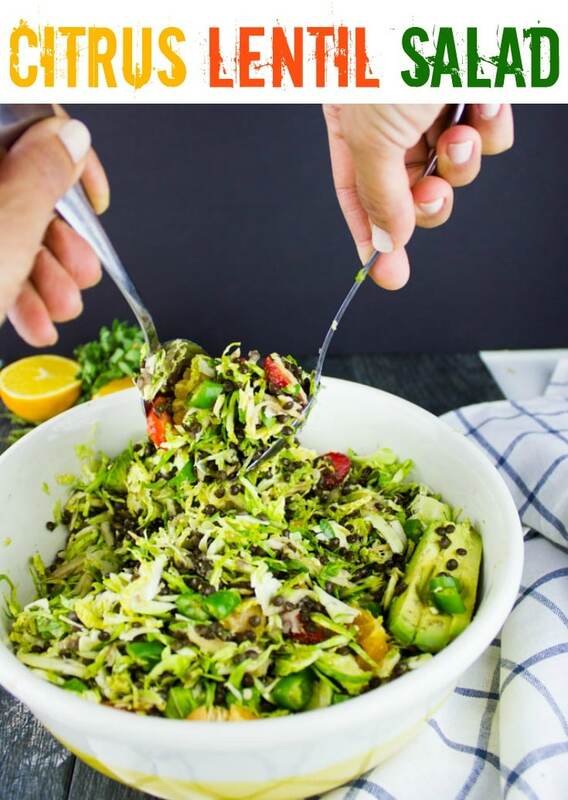 This Citrus Lentil Salad with Shredded Brussels Sprouts is a combo of hearty, creamy, crunchy, zesty, bright, spicy, sweet, tangy, and pure deliciousness! It’s not just another salad recipe, I promise. It’s a full meal on its own. Lentils are such a superfood! Really, they add so much goodness to our meals. They’re delicious and creamy when they’re cooked, very hearty and filling, loaded with proteins, fibre and many nutrients, plus they’re extremely versatile. The easiest and best way to start adding lentils to your meals is the Half-Cup Habit. Simply start by adding half a cup of lentils three times a week to your meals. That’s it. But it does not have to stop with lentils. Think of all the other legumes like dried peas, chickpea and beans and now think of all the soups, salads, mains dishes, stews, plates of pasta and even desserts you could create with them! If you remember my simple yet pure comfort Soothing Garlic Chickpea Soup recipe which I posted a couple of weeks ago, that’s certainly more than half a cup per serving which is an absolute bonus! I share many recipe ideas on that post too, so be sure to check it out! 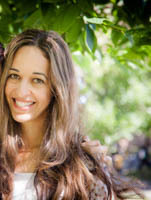 So have a look at this easy simple video for my lentil salad! Super easy, super flavorful, super good for you and it’s tastier than any salad you can imagine! First of all, it’s about cooking the lentils to perfection. I share so many tips on my favorite ways of cooking lentils in this Mexican Style Lentil Detox Salad ! While I’ve tried many ways of cooking pulses, I have to say the results are almost the same. So don’t stress about brining, soaking, oven or stove. Just make sure you salt your lentils after they’re cooked. If you have a pressure cooker, slow cooker or instant pot, I would strongly suggest you cook the lentils in there! Once the lentils are cooked, you can use them warm or chill them and use cold. But before tossing the Citrus Lentil Salad, make sure to add some flavor to the lentils. I do that by adding a couple tablespoons of the zesty bright orange dressing to the lentils and toss it well. 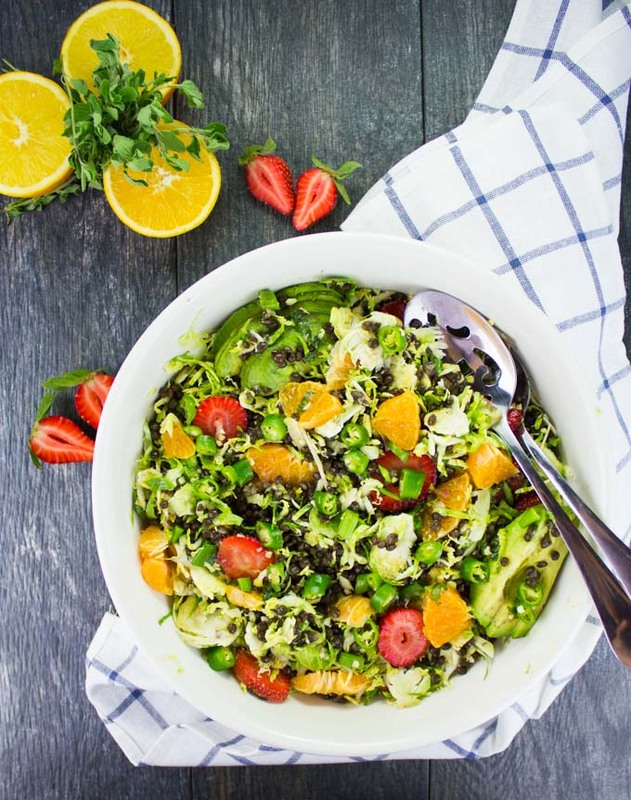 Crisp, Shredded Brussels Sprouts are a delicious addition to this bright Citrus Lentil Salad! 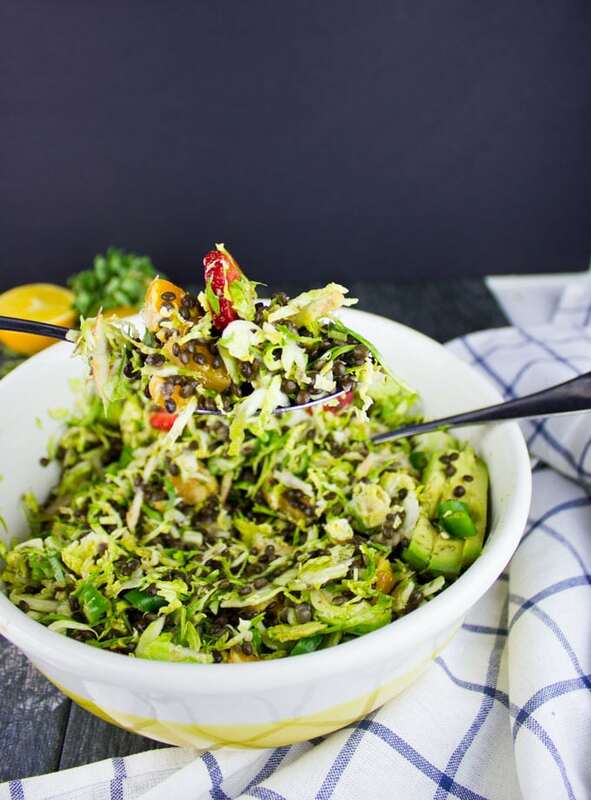 No matter what issues you have with Brussels sprouts, try them shredded like this and tossed in a bright orange dressing with creamy lentils, and you’ll certainly change your mind! Another thing I love about Brussels sprouts is how healthy they are. However, for the record, you can use shredded cabbage, your favorite greens, kale, anything! Other ingredients I love to include in this Citrus Lentil Salad some clementine slices, strawberries, shredded apples, scallions, avocados and whatever you prefer! I finish my Citrus Lentil Salad off with some chopped green chillies for a boost of spice. Finally, a note about the dressing—it’s orange juice with a touch of lemon juice, garlic (which you skip or substitute with onions), herbs, honey and olive oil. Just shake and go! For cooking lentils perfectly, make sure to read my tips and watch the video. Make sure to season your lentils before tossing the salad. This Lentil Salad can be made with warm or cold lentils. If warm, the strawberries and shredded Brussels sprouts might wilt a little. Cook the lentils. Add the lentils and water to a 4-quart cooking pan and bring to a boil. Then lower the heat to low and allow the lentils to cook for about 1 hours until tender. At that point add the salt and strain the lentils. Set aside. Prepare the dressing: Add all ingredients in a Mason jar or sealable container. Seal and shake well until the dressing has blended. Season the lentils with 2 tablespoons of the dressing and toss well. 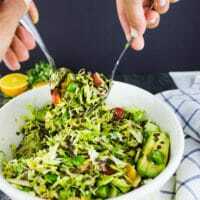 In a large bowl, add the Brussels sprouts and lentils together with an extra 3 tablespoons of dressing and toss well. Add the remaining salad ingredients, more dressing and toss. That is such a lovely salad – so colorful and packed with delicious ingredients. I love all the delicious ingredients in there, Pinning it to try some time soon. All the wonderful winter flavors in one dish! Definitely a must try salad for the winter holidays!